So we picked up our new family member in Columbia, SC while staying at Sesquicentennial State Park. 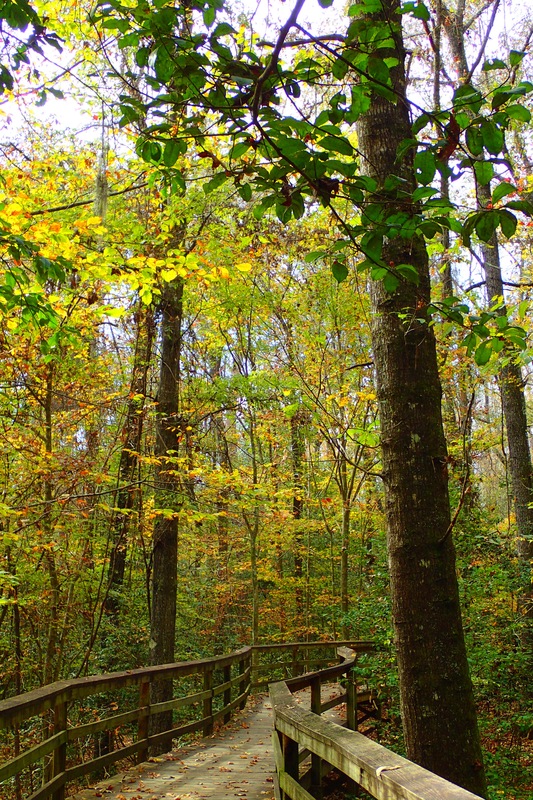 This place was a bit of a challenge for us: we generally enjoy state parks, finding them to be a great value for reasonable services in nice, uncrowded settings. 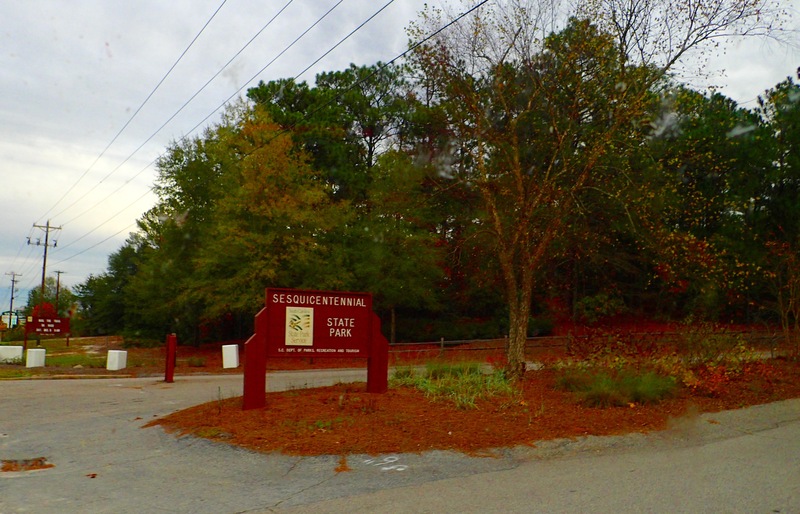 While Sesqui had all that, their road and site maintenance left a lot to be desired. Inside the campground itself the roads are packed dirt and gravel with lots of poorly filled potholes and at least one very tight area in the back loop between two mature trees. The actual RV sites, though plentiful, are packed dirt with ruts, awkward approaches, significant mud, and worst off all, many of them are laughably un-level. I mean, not only would it be impossible to level any kind of rig on them, some would be difficult to even back into, the angle being so steep. After trying out two spots that were unsuitable, we finally got some help from a ranger, who directed us further around to some of the larger sites. Even then we had trouble, taking a pass on the one she had in mind before selecting one of the few pull through spots. 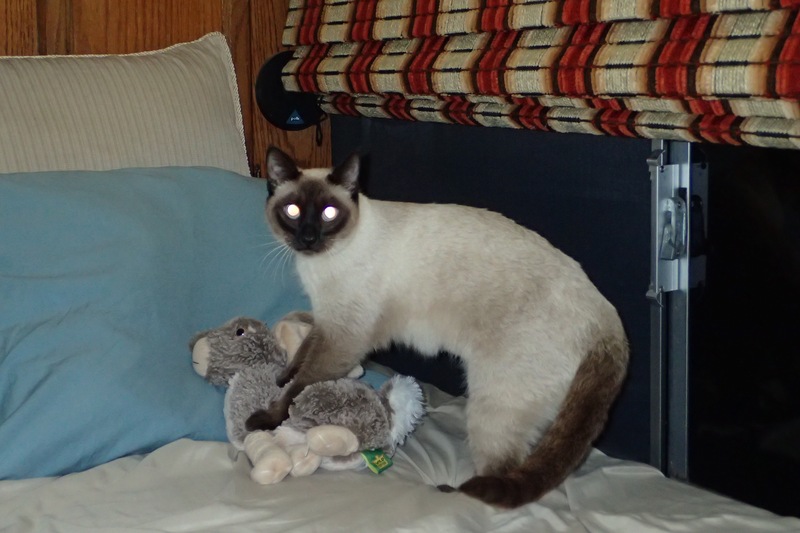 We hooked up 30 amp power and water (no sewage, though a dump station is at the front of the camp), and went to pick up our Pad Kee Meow in Loki. Returning after dark we got our new cat settled in before noticing that the electrical power was fluctuating quite a bit, our inverter and breakers clicking, before it finally kicked off entirely. I played around with the breakers on site and at the main panel a few spots over before giving up, cutting our high demand breakers on the bus to prevent an overload, pulling out our adapter and plugging in to the regular 20 amp circuit. The next morning we contacted the front office who sent out their maintenance ranger, and he had it squared away pretty quickly, replacing the 30 amp breaker. 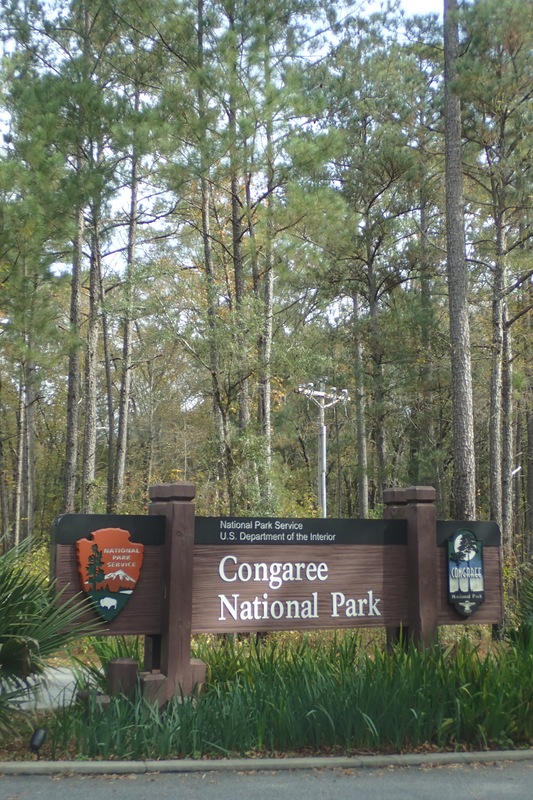 We spent an afternoon at Congaree National Park down the road, exploring their visitor center, watching the park introductory movie, and doing some very light day hiking along the raised boardwalk trails and one of the regular loops. 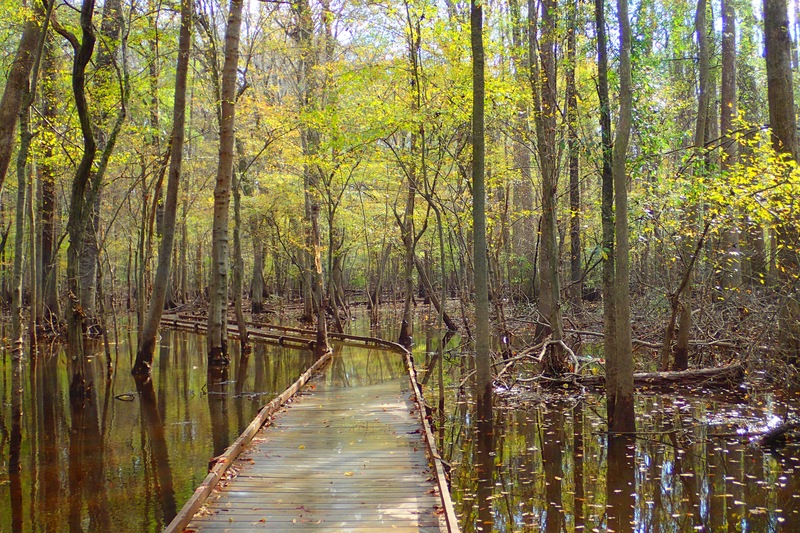 Rosemarie was feeling a bit under the weather during our stay, and the recent heavy flooding in the Carolinas had left most of Congaree’s trails impassable, so we spent a lot less time at this NP than we would normally. It is a beautiful place, but a challenge to see because in the summer it is damned hot and muggy, and in the fall and winter it floods regularly. At the end of our Sesqui thee day stay we had a bit more drama. Upon our initial entry we made note of the three short but steep sections on the main park road leading down towards the ranger station and campground. I had a twinge of nervousness about how we would handle the grade when it came time to leave given how underpowered and overgeared we are. Sure enough, as we departed Kahuna struggled mightily to get up the steepest of the three hills, our attempt aggravated by an inability to get a “run-a-go” at the grade since the roads are very curvy. After a couple of tense moments we made it up to the top at a slow crawl. From Columbia it was on towards Wilmington, with the plan to drop off The Big Kahuna at the the place from which we bought him for temporary storage while we took our tow vehicle, Loki, for visits with family in Norfolk, Virginia and then back to my Mom’s and Stepdad’s house in Wilmington. Things worked out a bit differently. More to follow. A cliffhanger! Hope you had a great holiday with your family and love seeing pictures of the new kitty companion! Yes indeed. A lot of changes these last two weeks.